You might expect the menu of an Oregon coast restaurant to be heavy on seafood. But that’s not the case at Yachats Brewing and Farmstore. Here, every dish on the menu comes with a house-made fermented side such as sauerkraut or kimchi. The culinary team cultivates strong relationships with local farmers, fishers, wildcrafters, and ranchers so every ingredient on the menu is locally sourced, and mindfully chosen. Theirs are wholesome, rustic and designed for good health. The menu isn’t the only thing they do differently here. The name reflects the store’s beginning as an actual farm store. Over the years since it’s opening in July 2012, the store has slowly changed what they sell. While it will still sell books, ferment supplies and a selection of growing supplies, the greenhouse room was expanded to hold lettuces, micro-greens and herbs. At each step of the way, they enlarged the kitchen and dining areas. As customers discovered the place, they wanted more food. Customers came to appreciate the emphasis on fresh, local ingredients and small batch beers. Their commitment to offering healthy fermented foods grew along with their business. 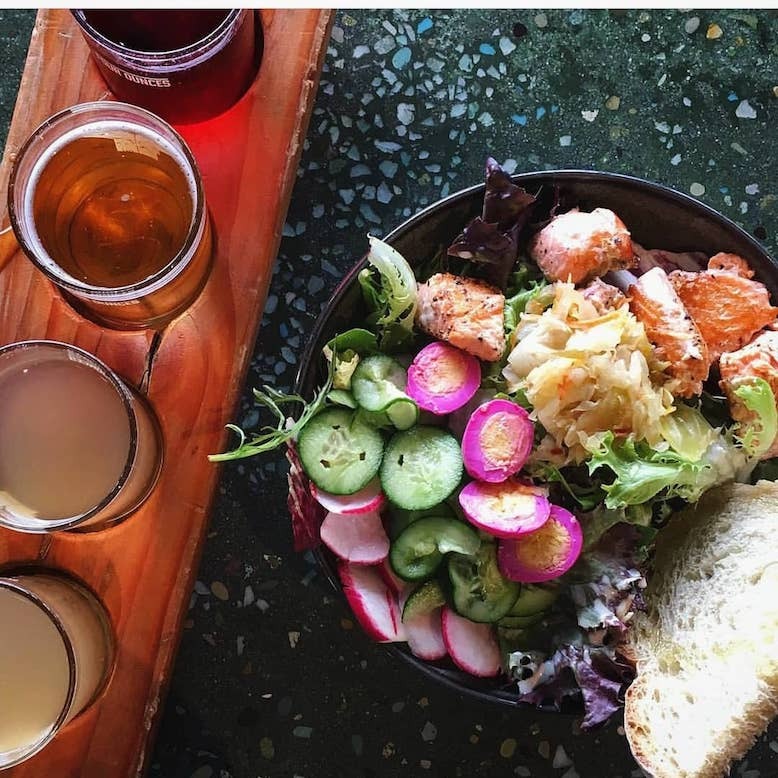 Similar to beer or wine tasting flights, Yachats Brewing offers a flight of four fermented foods served with gluten-free crepes. 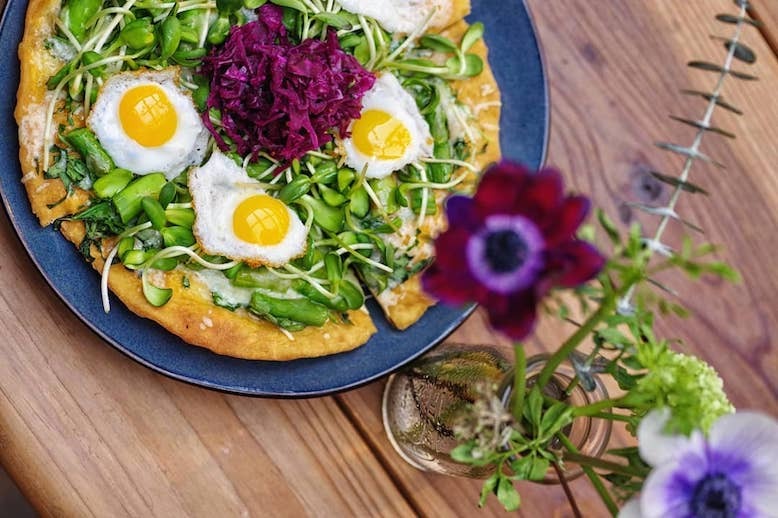 A dollop of some fermented side accompanies each menu item, such as the Pulled Pork and Apple Grilled Cheesy sandwich or the brunch flatbread with bacon and eggs. Unless you specify, the chef will likely choose from their kimchi, traditional sauerkraut, caraway kraut, cortido (a Salvadoran kraut with carrot and oregano) and a seasonal ferment or pickle. The cheese and charcuterie board features the red horse kraut, made from red cabbage and horseradish. 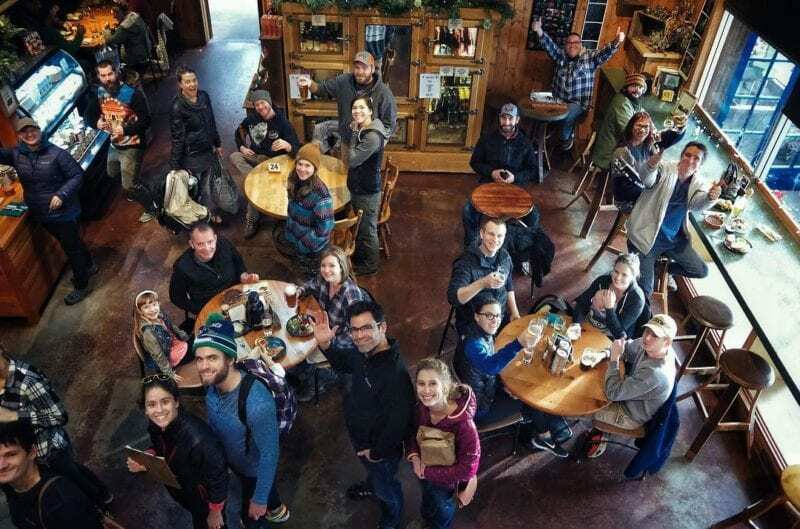 Many Yachats Brewing visitors get a ferment flight and a beer flight. To demonstrate their commitment to fermented foods and drinks, Yachats Brewing does not sell any soda. Instead, if you want something non-alcoholic and fizzy, you can choose from the house brewed fermented drinks, such as the kombucha, hop soda, kefir, and a floral jasmine jun (similar to kombucha but made with honey). Nathan Bernard is a woodworker. His skills transformed the former bank building, built in 1965, into a cozy, warm space decked out in salvaged Oregon wood and wine barrel furniture. Using salvaged and reclaimed materials almost entirely, the space remembers its small-town logging roots but also looks firmly into the future. The store has a small but growing beer lineup thanks to expansion in their brewing capacity. Yachats Brewing formerly supplied three taps of its own small-batch beers made from a 20-gallon system. They now have a 7-barrel brewhouse. With 30 taps, customers can choose from more than 17 house beers and meads along with a variety of guest beers and ciders. Take your drink of choice with you to explore the beach in a travel-friendly can growler, or “crowler,” which consists of a filled and sealed can rather than a glass growler. Editor’s note: Updated October 26, 2018.